This was back in 2001? I’ve lost track of the date. 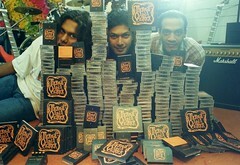 But the day we got our production of Cd’s and Tapes is still quite clear… ‘lil did we know what we were getting into!